To remember those golden days of our childhood I have started to give school snacks. I was very much inspired by Iwata Rumi’s Photos. Thanks Rumi. Though our cream roll and cream horn are same thing with different name and bit different shape. 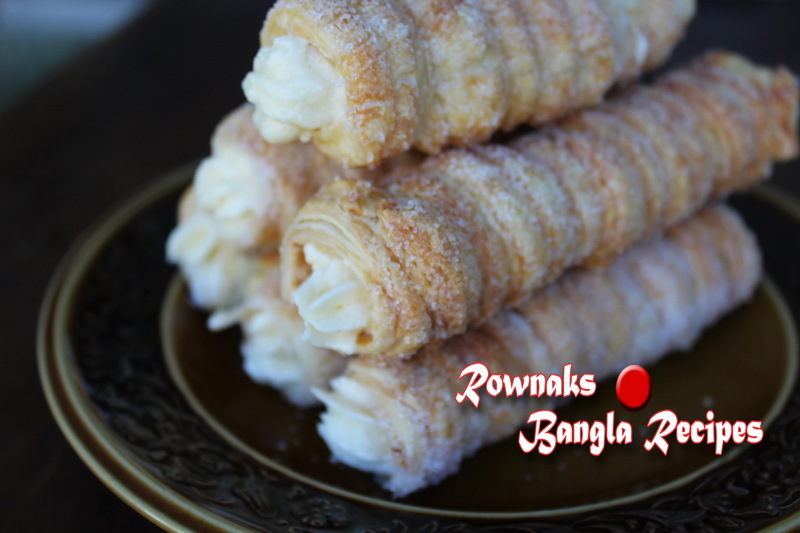 Just in Cream Horn first goes strawberry then cream, our very own Bangladesh Cream roll just has butter cream. I used store bought puff pastry sheet to make life easy. But if you are in Bangladesh, you have to make it (Hey home made is the best, bit of effort need. 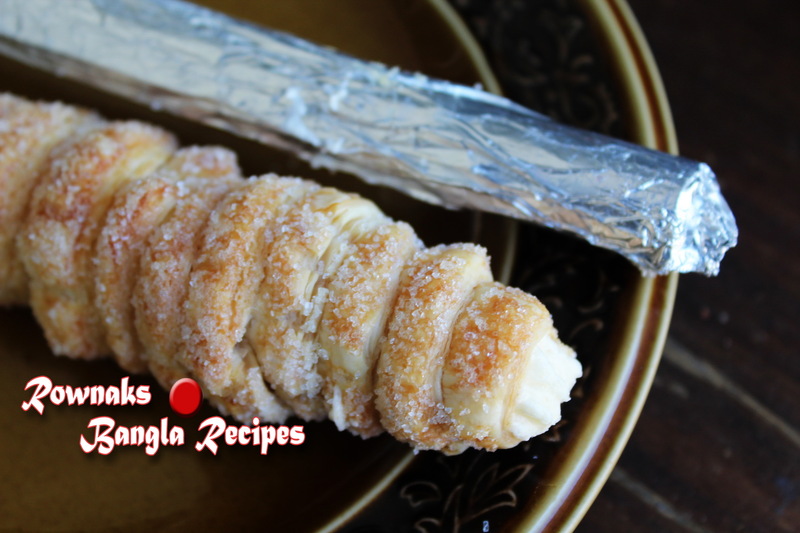 I am adding puff pastry recipe for your convenience in Bengali) Hope you will enjoy this recipe which hopefully will take to your childhood “the Best Era of Life” . 1. Wrap each bamboo stick with aluminum foil to make the mold and spray oil or brush over each mold. 2. Preheat the oven on 150˚c. 3. Cut each puff pastry sheet into 12 strips. 4. Starting at the point of the mold, wind the pastry around the mold, overlapping the layers slightly to cover the cone with a spiral of pastry. I need little bit more than 2 strips. 5. Repeat the process to make 10 rolls and roll in caster sugar each roll. 6. Take a baking tray, place aluminum foil over it and spray oil. 7. Place rolls over the foil and put into oven. 8. Bake the rolls 1 hr or till it becomes crisp and golden brown. Let it cool down for 10 minutes then remove from mold gently. 9. Whip butter with sugar and vanilla essence until stiff and add milk if needed. 10. When rolls cool down, Pipe cream in each roll and enjoy the flavor of cream roll / cream horn. Apu, cream roll banate je mould use koresen ota Australia te kothay kinte pabo? try kitchen shop or cake decoration shop. Thanks. ki bole j tomay dhanyobaad jaanaabo. katodin dhore a recipe taa khunjchhilaam. shab e jaani (puff pastry, cream) kintu ato shahoj baanaanor padhdhoti taa jaantaam naa. ps: tumi ki aamaake ichaar murhar recipe taa dite paarbe? Apu ai roll gula ki banae dee fridge a rakha jabe? Mane Pore ber kore oven a dibo. ami kokhono fridze rakhini. but raw fridge(freezer) korte paren.. r pore ber kore bake korben. where i can get puff pastry sheet?I lived in USA. Check in any local supermarket frozen section. Thanks. I love your cooking, always using your recipes to make yummy bangali food. Keep up the good work apu. Thanks a lot for your kind words.